Delicate and sparkling, this Miadora engagement ring is crafted from 10-karat white gold to add sparkle and shine to your look. The ring features a sumptuous created white sapphire center stone, raised over a delicate infinity shank. More glittering white diamonds line the band, completing the shimmering appeal of this brilliant and versatile engagement ring. All weights and measurements are approximate and may vary slightly from the listed information. *T.W. (total weight) is approximate. 1/10 carat T.W. may be 0.08 to 0.12 carat. Treatment code CR (created white sapphire) and N (white diamonds). See Treatment Guide for further information. This ring is so beautiful and well made! But after having this ring for some months I have to say, the white sapphire dulls out in about a week or so and soon disappoints. The middle stone is large and beautiful. It is clear and looks great. The stones on the side are a bit smaller than the picture but still sparkly. For the price, this is a fantastic ring. Definitely recommend. Pretty ring, was just a bit "flashier" than I expected. I think the small diamonds on the band part actually tend to make the ring look "overdone" rather than adding anything. I sent it back, still looking for a ring with a similar braided look without the extra diamonds in the band. Ring was easy to return with no hassle. It’s beautiful! Especially for the price. It sparkles like a real diamond. I wear a size 5 and it fit perfect. I love how dainty it is bc I have tiny fingers. I recommend it and I’m sure you will love it!! This ring looks expensive and has lots of detail to it. Very pleased. The sparkle and shine it has when the light catches it is intense and eye-catching. Very beautiful ring to have and to wear! I received this ring today and it’s gorgeous and sparkly. However the band is a little tiny than what I expected, but the stone is a decent size. It’s a lovely ring and I feel inlove with it the moment I put it on. Definitely recommend this item. Came in the mail plenty of time. 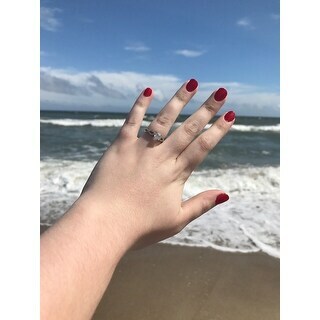 My fiancé loves her ring! Dull diamonds, went foggy after 2 months of wearing. Didn't even last long. It went from being very shiny to no shine at all. Cleaning did not do the job. Very poor quality. A refund is being issued to me. 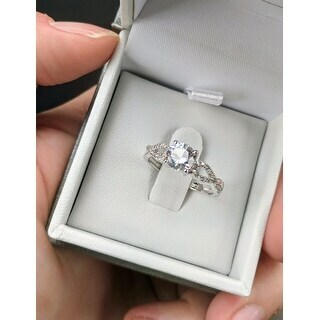 My fiance absolutely loved this ring and so did I. Overstock offered great customer service and I plan on ordering my wedding band through their service. Great value for the price! I would recommend it to anyone who is looking for an engagement ring who does not have a massive budget! Definitely worth more than what you pay here! ring is beautiful! well worth the price! "Are the sizes of this ring accurate? I got my fiancé a temporary ring until I could afford something better, and I absolutely love this ring for her. Her ring she has now is a size five so I was just wondering if this ring in a size five would fit perfectly. " Our Miadora products are fit to industry standards. As long as your Fiancé’s current ring fits the same, you should be good to go! "Are there any type of warrant on the stones? What if one comes out? " "I can't find band to go with this. PLEASE help. Looking to order both "
"What would be a good matching wedding band for this ring?" Hello Louis, great question. I was able to find that there is a matching band that goes with this ring. Item#17218006. Have a great day! "The white saphire on Item #: 15870263 has the exact same color on the photo as the aquamarine ring Item #: 15877983. One should be white and the other light blue. The photo shows something in between. I don't know which one to buy because of this." Hello berenike01, Overstock tries to represent the colors of our products accurately, but unfortunately due to the difference in monitor colors we cannot guarantee that the color will match exactly what you see on your screen.I think that the Miadora 10k White Gold White Sapphire and 1/10ct TDW Diamond Ring (G-H, I1-I2) Item #: 15870263 has more of a white color to it, and the Miadora 10k White Gold Aquamarine and 1/10ct TDW Diamond Ring (G-H, I1-I2) Item #: 15877983 has more of a baby blue color to it or a light blue color. I hope this information helps. Thanks for shopping with us!